When The Matrix was released in 1999, the film took the world by storm and at the time the overflowing positive response to the work seemed absurd. A cool science fiction film for sure, but treating it as if it was a game changing, landscape shifting achievement seemed a bit over the top, the typical initial reaction to something new and exciting before the hype would eventually die down. Don't get me wrong, I loved the film initially and I wanted to see it again and again, but was it possibly as good as everyone was making it seem? Well, here we are fifteen years later and the hype was real, the praise well deserved, and because of The Matrix the game was indeed changed and the landscape shifted. Not only does the work hold up extremely well despite the various technological advancements and bigger, splashier budgets since then, the general aesthetic of the film remains fresh and spellbinding to the point that I can't help but wonder, how can something be dated if it was released ahead of its time? Perhaps the Wachowski's set the bar and then waited for the rest of the cinematic world to catch up. I am currently 30 years old and a film that was released when I was entering my sophomore year of high school remains just as visually jaw dropping as it was on opening night. The screenplay is just as complex and stimulating today, as no matter how many times I view this film I can't help but admire the dialogue, an overlooked factor into what makes the experience so great. The action sequences are handled with such confidence and the set pieces are extraordinary. The Matrix is a film overflowing with big ideas, a masterful example of how exciting originality and innovation are in a world filled with uninspired, recycled concepts. 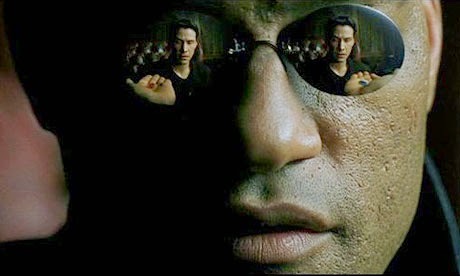 It would be a massive shame to allow the far lesser second and third films of the trilogy tarnish what was achieved here with The Matrix, a film that changed the course of the medium forever by opening our eyes and allowing our minds to process things that we never could have imagined on our own. It has probably at least nine years since I last watched the other two Matrix films, and I want to give them a fair shake and reevaluate them. Expect those reviews soon, but even if they are as unfortunate as I remember them to be, nothing will ever change how incredible and unforgettable this first installment was. I am a huge fan of science fiction, and The Matrix tickles me in every possible way.